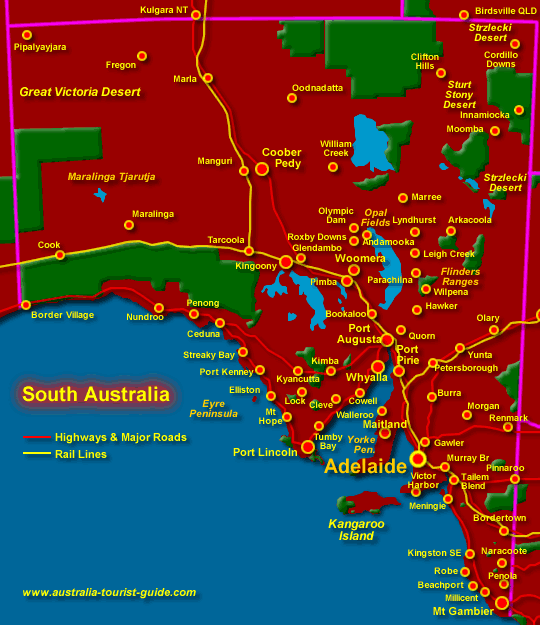 This entry was posted in Cultural Identity, Customs, History, South Australian History, The Way We Were, TROVE TUESDAY, Women's History and tagged Australian History, Cultural Identity, Customs, Family History, South Australian History, Trove Tuesday, Way We Were, Women's History by Catherine. Bookmark the permalink. ‘Washing day a pleasure’? I love this! It would still have been hard work, but maybe a lot less than doing the dreaded wash in the traditional way. I researched that a year or so ago, and it was back-breaking work, especially for women like my great-grandmother, Mary Maude, who lived in the country, lugging heavy buckets from the stream or the well and boiling, boiling, scrubbing and wringing all day. I’m gald I live in the 12st century! The sufragette protest in fascinating, too. How scornful they were about women voting – the very idea. I love putting our ancestors’ lives in context and getting glimpses of their lives. It is a joy trying to put their lives into some sort of context, eh? … Cheers. Only 5 suffragettes caused so much trouble?? What a bunch of wimps. Such a threat to national security! Shame there were only 5 there on the day. They must have been very formidable women (good for them!). Incredibly courageous, and determined women indeedie. Toodles. I love these old items from 100 years ago. Oh yes, 100 years ago is indeed a fascinating time. Am remembering that somehow you found my blog about “bathing costumes” of 100 years ago, I checked out your blog and fell in love with Miss Muffly, you Grandmother, and am constantly entranced by her Journal/ Diary entries as a teenager 100 years ago. Guess this is why when I decided to start on this “Trove Tuesday” exercise, 100 years ago seemed the appropriate time to go backwards in time. Thanks so much for the daily delight you and your Grandmother bring to my life, Sheryl. Must say that it’s fascinating, to me, that I see her as a young teenage girl only and find it hard to think of MY Miss Helen Muffly actually being your Grandmother. Great story Catherine!! 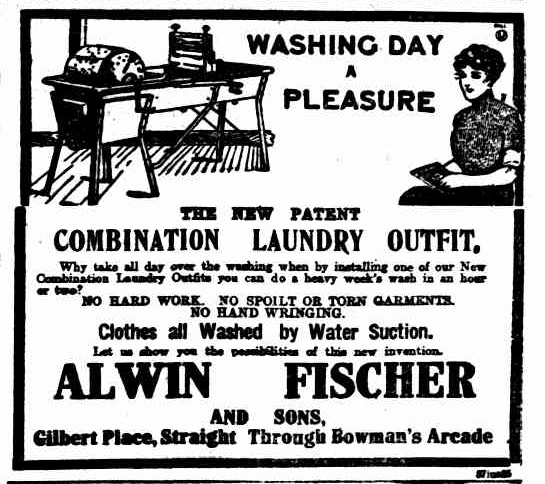 Mum had a wringer washing machine which I used to do the family washing. I’m glad we had hot and cold running water though. That picture reminded me that when I was very young mum had a wringer set like that between two concrete tubs with a “scrubbing board” in the left tub and a copper where she boiled up “the whites”. The right hand tub was for “rinsing” and for “bluing” the whites. Amazing how these things come back to you eh? Hot and cold water sure is a plus, eh?… I seem to remember that your childhood home was in the countryside, the Adelaide Hills, was it Kyle? Bye for now. Made me smile…in so many ways…washing day a pleasure? I still don’t think so, and of course, it is a breeze compared to how it was. My dog loves it though… he races in and out of the laundry with each load, tail wagging, big grin… I haven’t quite worked out what the attraction is, but he wears himself out each time. As for the contraption that was supposed to make things easier 🙂 .. Firstly, whose laundry would be big enough for it and it still looks as if you have to bucket water. 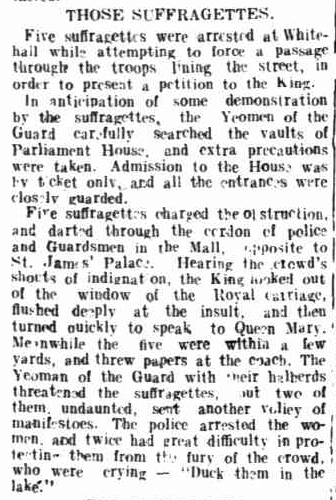 Also, if it saved time, no wonder those pesky suffragettes had time to threaten the King with a petition… paper can hurt … You’ve left me smiling, always a good start to the day! Glad to have put “a smile on your dial” Chris 🙂 … Yep, you’re right. You would have to bucket the water but look at that “corker” spinning thingo which would cut down on the “rub a dub dubbing” and what a relief to the forearms to not have to do all that twisting & wringing. ha ha ha… reminds me of the story I loved to read to my 6 year old students, over 20 years ago, and they loved to hear it. Was titled: “The Wild Washerwomen”. How lovely to have a chirpy little companion keeping your “Washaday Blues” away. Toodle oo for now. Oh. My. God. 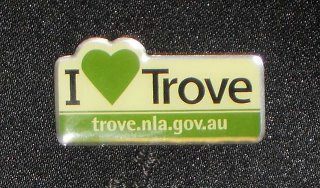 That I heart Trove pin! I must have one! It sure is gorgeous, eh metan? … You’re welcome to “lift it” 😀 You sure find some fantastic articles on Trove and those “You Tube” vids. Whooo Hooo!!! Washing Day was a nightmare…I used to hate it when I was on school holidays. I’m the sort that throws everything in an automatic machine, hangs it out and gets on with it. I don’t really empathise with the need to complicate wash-day as some of our older generation still do. In the machine, out on the line, that’s me! ha ha ha… me too Pauleen 🙂 … but then I’m like that with all housework and even moreso the older I get.